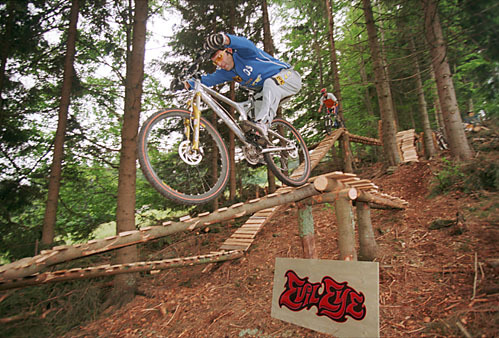 Kenny Belaey (23) from Belgium is the current UCI Trials World Champion 26”, and I understand why. After spending a week and a half with him I have to say he is the best trials rider I’ve ever seen – maybe that’s why they call him the ‘Magician’? 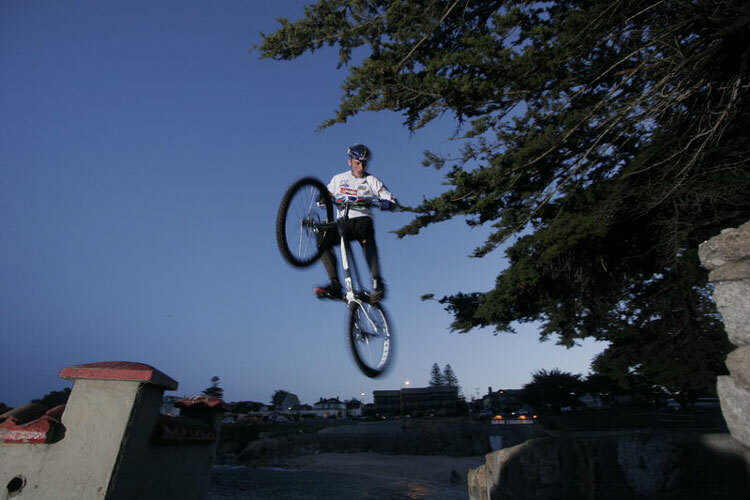 Kenny came to California in April ’06 to train for his upcoming trials season, to visit the Sea Otter event and maybe to learn a trick or two from the old dog, but not necessarily on the bike. I had met Kenny a few times briefly in the past few years. 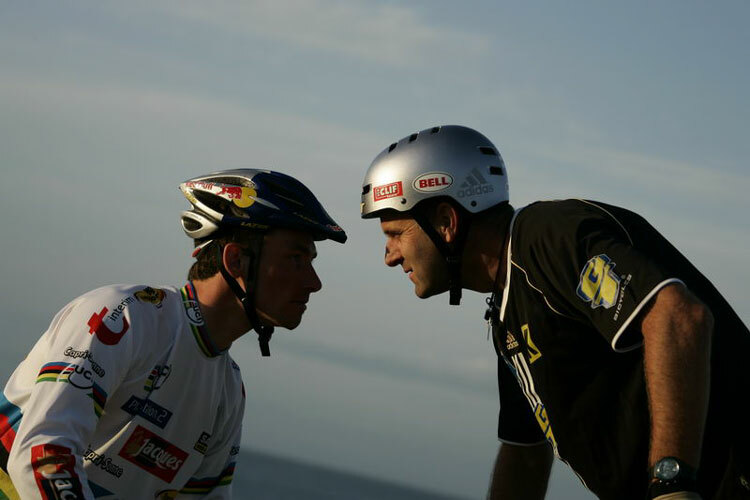 I watched him at the Trials Worlds in Livigno, but I never got to spend much time with him before. I knew about the new school riders, their long bikes with different geometries, the tapping and side-hop techniques, etc…. but seeing it and experiencing it up close was incredible cool and incredible humbling; especially on my own turf and training grounds. Not that I had any hopes to be able to hang with him, but the level he rides and the obstacles he tackles are mind blowing. 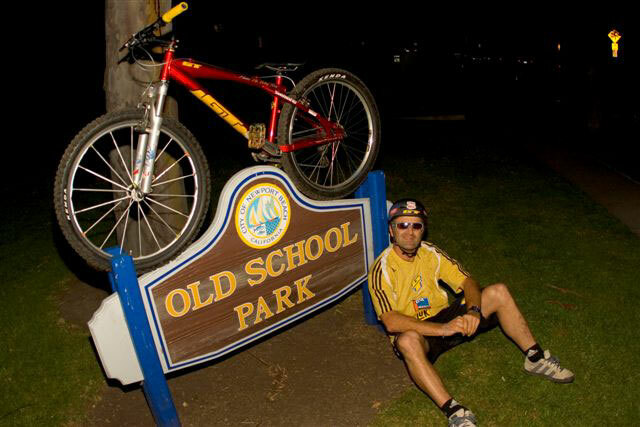 I got a little taste of what it must have felt like for Kevin Norton (former US Trials Champ who had brought me to the USA) when I first came over to the States 20 years ago, introducing a whole new level and style of riding. n clean sections I did not think were possible, even after seeing him ride before. His dedication, precision and focus are of the highest athletic level possible. 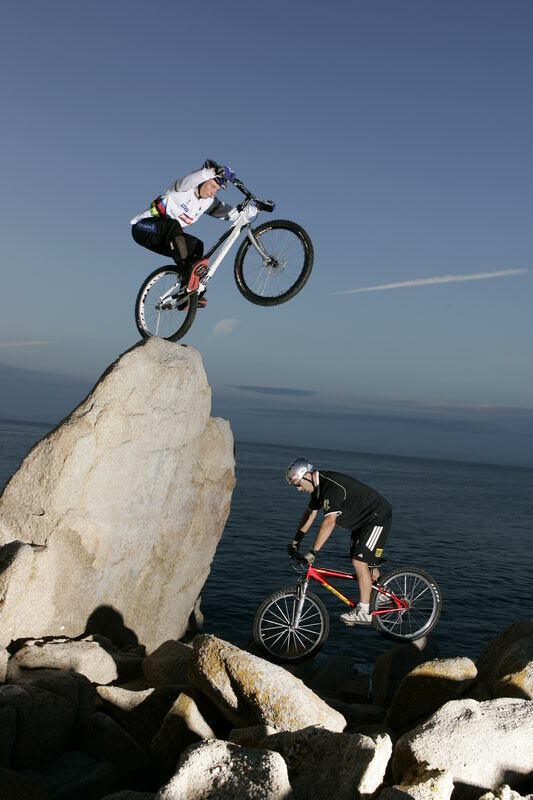 As a matter of fact, some of the rocks he climbed on his bike, without ever using his feet, pedal, chain-ring or any other part except his tires – are impossible to climb for the best athletes on their feet (without a bike) and without using their hands. Kenny, and for that matter, most top trials riders, don’t get enough respect for what they can do. I don’t want to sound biased, but trials offers more than most other sports. 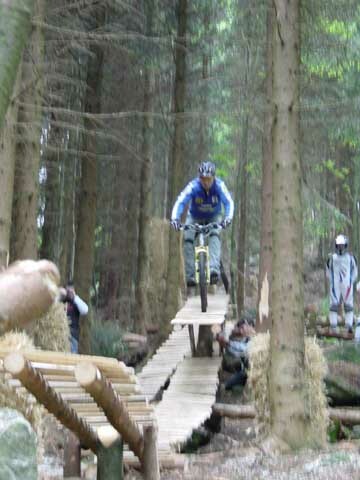 It’s a great spectator sport, it can be done on every level (may your obstacle be a curb or a 6 foot wall), the terrain and sections are constantly different and new. If Golf and Baseball can draw millions of spectators on TV, one would think Trials should stand a chance? Kenny not only got to see my favorite training spots in SoCal, but he also got a taste of my life, work and has probably more of an understanding why I’m still busy as ever approaching my 40th birthday. He got to hang at the GT pits at the Sea Otter, met my trials riding buddies as well as legendary mountain bikers such as Cedric, Peaty, Lopes or Frischi. He also got to experience some proper XC mountain biking with the infamous Laguna Rads and sample one of my downhill rigs as well. He learned some new insights about the Trials history and got some new understandings of our industry. Overall it was very inspiring for me, I rode more trials than I had in a while, between all the photo-shoots we scheduled and our training sessions. I learned some new moves and others I got, at least, to comprehend. 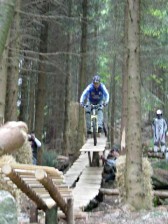 It was a whole new level of riding, a lot of Kenny’s sections, I couldn’t even get through. 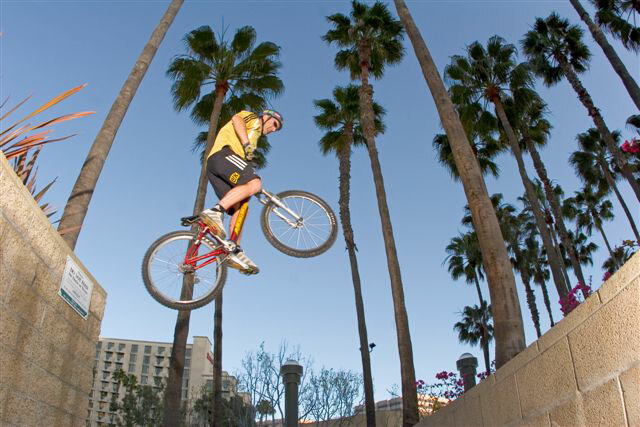 He can jump up a 5 foot wall straight to his backwheel, with one pedal rotation run up, he can jump a gap of two bike length or side-hop 125cm, he rides calmer on a 10feet rocky edge – than most persons on the edge of a curb. Seeing is believing, I wonder when the American/ Canadian bike movie makers will discover the talents of riders like Kenny? Kenny’s main sponsor is actually an Belgian Road Cycle Team (Jacques), he is the 21st man on the squad, it’s a UCI road team, which means we receives their minimum salary cap. They didn’t take him on as a show man for trials shows, they are supporting him for his competition approach, to win and defend the Rainbow Jersey. Red Bull has sent him all over the world to do trials shows and Playstation is plastered all over his uniform. French Bike company Koxx sells a special edition Kenny Belaey trials bike. He is doing alright, especially compared to most other trials riders. His approach is good, he is relaxed but focused, he has a good sense of humor and is quite wise for his age. He is also the UCI riders representative. 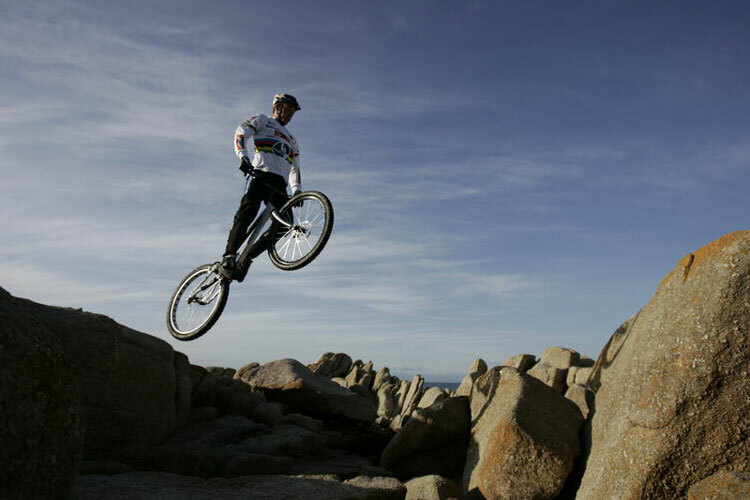 I think he will be successful, not just in collecting Rainbow Jersey’s, because he understands that it takes more besides being the best trials rider in the world. Thanks Kenny, for taking Trials to the next level. A couple of years ago, I was only seventeen and I was watching tv on a saturday morning. I was watching a show on tv called Pacific Blue and it featured a “trials rider”. It was nobody else but Hans Rey playing… Hans Rey. 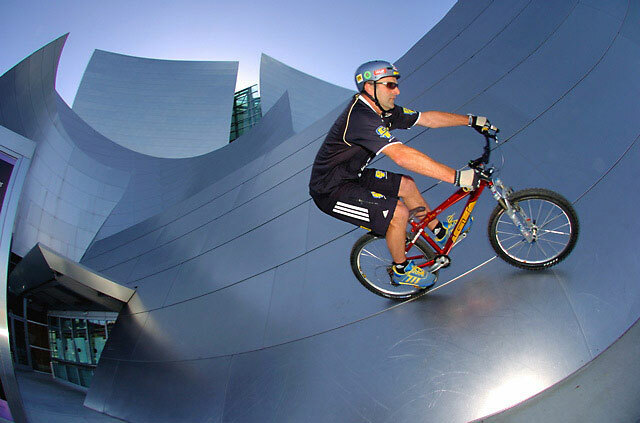 What an accomplishement, I figured, with a trial bike in Hollywood. I noticed the amount of sponsors on his shirt as well. Going from GT Bicycles, Adidas to Swatch. From that moment on, I just knew it. 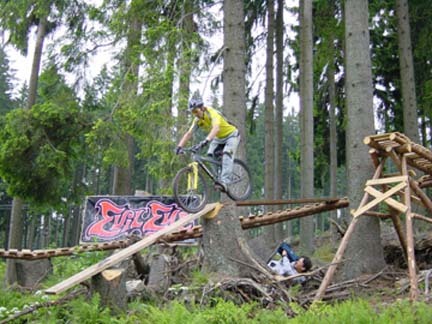 There’s more to trial bike than hard work outs and competitions. I started to broaden my horizon, to be honest, I even copied one of Hans’ tricks. The one where he’s throwing a man to the ground, legs spread out, and then dropping off a two meter wall and landing with his front wheel right in between his legs. In the years to come I made a lot of progress and won lots of prizes, but I was never fully satisfied in a sportive way. Hans gave me some good advice. “You need to keep the ball rolling…”, he said. And thank God, I did. I’ve always been inspired by Hans’ personality, his way of taking care of bussiness. Everytime you work with a sponsor, even if you’re just riding bikes… you need to take care of business and constantly work hard to hold on to all who support you. The more I took things seriously, the more I started believing in a career. 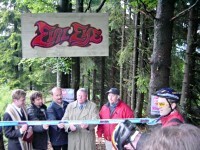 I find it reassuring that Hans is still busy organising all sorts of projects for and from his sponsors. 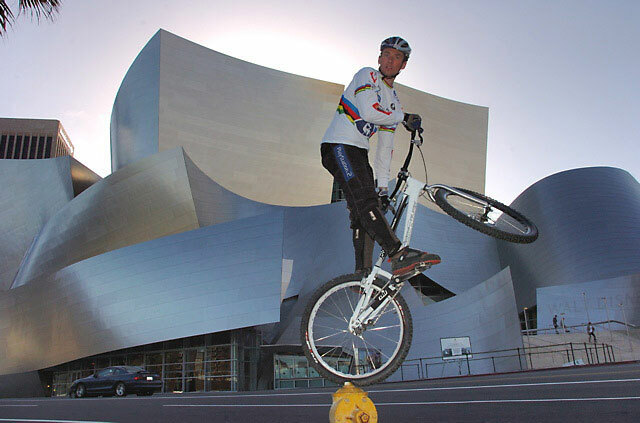 It proves that after my career as a professional sports athlete, I can keep on riding – if I take the right measures. When I told him my idea to write a story new school vs old school trial I didn’t really know what to expect. Luckily, he saw the potential as well and so we started to brainstorm right away. Our angle was to go with the flow, which emphasises his adventurous side. I was glad that my trip to the USA really paid off, even more than I expected. By the time I arrived in LAX, Hans was already there to pick me up. We went straight to his house in Laguna with a phenomenal view over the ocean. He’s living in a cool neighbourhood and it has a nice atmosphere. Next to that there where some amazing spots to go and practise. Overall Hans is a very cool guy, but then again, who would have thought otherwise. I noticed that Hans and I have the same habbits. To check our emails, make our phonecalls, follow up our bussiness, work out hard, visit some friends and think about the next trip. During our trainingsessions I saw that Hans is probably the only forty-year-old that still possesses the same passion as in his topyears. I hope I can say the same for myself in a few years. As for his projects, Hans has set up a charity project called Wheels 4 life. It’s goal is to collect money to buy bikes and send them to third world countries. In those countries it’s easier to get a job when you have a bike to go to work.